South Lanarkshire Council UNISON members are being balloted along with their local government colleagues across Scotland in what is seen as the first big test of the new Trade Union Act 2016. This tory government legislation means that unless 50% of eligible members take part in the ballot, UNISON cannot call industrial action. There have been localised disputes, but this is the first large scale UK ballot under the new legislation. Mike Kirby, UNISON Scotland secretary said, “This UNISON Scotland ballot affects every trade unionist. It is important that we show the UK government that we will not be bullied by the Trade Union Act 2016. Local government staff have seen big cuts in pay and they have the right to decide how they negotiate with their employers. We urge all UNISON members to return their ballot paper before the 30 May deadline. In the recent consultative ballot UNISON members overwhelmingly rejected the employers’ pay offer for 2017/18 – by 78% to 22%. The employers’ offer was: £350 flat rate for those earning up to £35,000; 1% for those earning over £35,001; Scottish local government living wage to be the minimum pay for all pay and allowances including additional hours, contractual overtime and other allowances. It will be pensionble. Following a resounding 77.6% rejection in the consultative ballot on the employers’ pay offer, UNISON will now move to ballot its 70,000 local government members across every local authority in Scotland on industrial action. 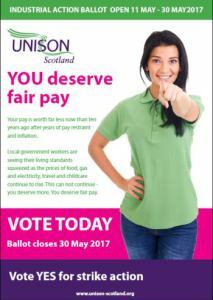 Dougie Black, regional organiser for UNISON Scotland, said: “Local government workers have suffered years of pay restraint and their pay is worth far less now than ten years ago. The cost of food, gas and electricity, travel and childcare continue to rise and, as a consequence, their living standards have been severely eroded. This can not continue. “If pay had even just risen with inflation a home care worker, for example, would be paid £19,900 a year when instead they are paid just £16,900; an early years’ worker would receive £24,100 instead of £20,400 and a library assistant would earn £26,400 instead of £22,400. And that’s just to keep up with the cost of living. Over 88% of Scottish local government members voting in their pay ballot have accepted a two year offer with a new Living Wage deal. Staff will now get a 1.5% rise from 1 April 2015 and 1% from April 2016. Importantly, the Scottish Local Government Living Wage of £7.85 per hour will be put in place before the 1.5% rise, making it £7.97 an hour. And in April 2016, the Living Wage will be increased to the recommended figure of the Living Wage Foundation, again before the 1% rise. There will also be talks on removing the pay points below the Living Wage level. Negotiators succeeded in getting the initial offer of two years at 1.25% front-loaded to 1.5% in 2015 which is above inflation and slightly increases the value of the 1% in 2016. In August inflation was 0.0% on the Consumer Prices Index and 1.1% on the Retail Prices Index. For an update on cuts, pay and proposed branch constitution changes and more.. The Canadian Broadcasting Corporation tonight hosted an online link up between three Hamiltons across the globe – Scotland, Canada,and New Zealand. Although separated by thousands of miles the stories couldn’t be any more similar. We are all fighting to expand the take up of the Living Wage through out both the public and private sectors not only as a way to eradicate poverty but also as a logical way to boost the economy. Sarah Wiktoski from the Poverty Alliance highlighted the Scottish situation and the particular success within the public sector. In the meantime the inclusion of the consolidation of the Living Wage throughout local government in Scotland in the recent improved pay offer is a great achievement. The results of the consultative ballot for local government UNISON members in Scotland was a resounding yes to accept the revised pay offer, with over two thirds of the votes for agreeing to the offer. Strike action for the 21 October had been suspended, whilst members were consulted on the offer… an offer that would commit the employers to the future participation in the agreed bargaining machinery, the consolidation of the living wage and the deletion of spinal column point below the level of the living wage. Whilst at South Lanarkshire Council, the living wage had already been consolidated, this was not the case for the majority of local authorities, so this is a great achievement for UNISON members throughout the country. However the fight for fair pay continues.